Now that we are on the official Great Divide Mountain Bike Route, there is very little pavement, few towns, and no services. 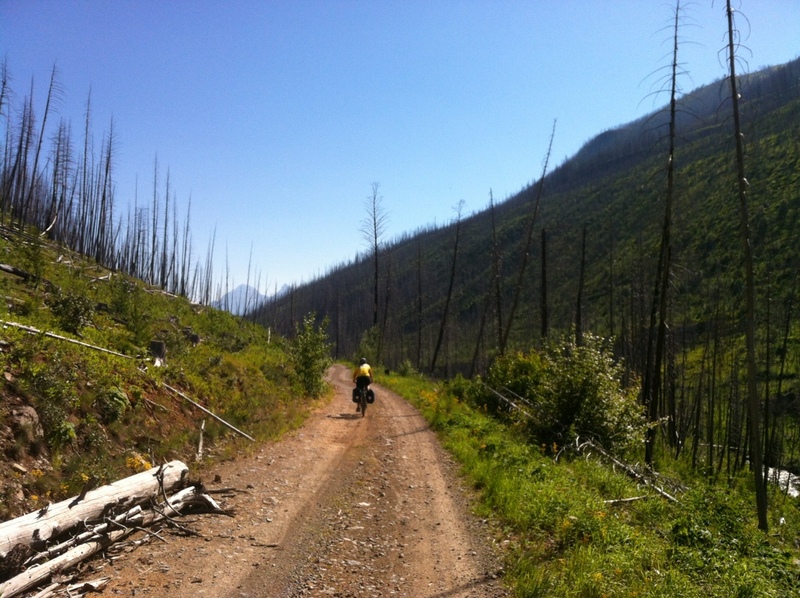 It’s been a hard three day’s ride from Eureka to Whitefish during which time we saw virtually no pavement and not a single store or water source other than lakes and streams. This is the true meaning of mountain bike touring and our first real taste of being out in the wild. I, of course, loved every second of it! I just have to start off with how amazingly lucky I am to be able to live the lifestyle I do. I have such a network of family and friends, and very patient employers, which all work together to enable me to take these epic adventures. The freedom of the open road – or narrow dirt track as the case may be – brings me so much joy there are almost no words. The incredible beauty with which I am surrounded makes the hard climbs seems easily surmountable. I feel my calf muscles growing, and feel like with this monster of a bike, I could go anywhere! Here I am rolling into Red Meadow Lake after a steep and rocky 12 mile ascent. Our 6th day on the road we traveled 32 miles from Eureka to Tuchuck Campground, a very remote Forest Service Campground on a road closed (at least at present time) to any motor vehicles. Despite the first 25 miles of our day uphill with virtually no breaks, I had absolutely no knee pain. I’m confident my pedal adjustment was successful and my knee problems have waned away. The first 22 miles of climbing was paved road, though not much wider than a bike path. It was a gorgeous winding trail high up into the mountains. Then the pavement ended and the trail went straight up the rocky side of a mountain. For three miles I felt like I was climbing up over a never ending Woodbury Mountain Road. Loose gravel, chunks of ledge sticking up, roots, and large rocks littered the road as we bounced on upwards towards our second Continental Divide Crossing. Sadly an avalanche had taken out the Divide sign at the summit, so we didn’t even get the pleasure of knowing just how high we had climbed. We are just outside the border of Glacier National Park and the mountain vistas are astounding. Most of the mountain tops have snow still, though we haven’t had the pleasure of hitting any on the roads yet. The summit of Whitefish Pass had horseflies galore but also thousands of beautiful tiny butterflies strewn across the roads and roadsides. They clustered on our jerseys and flew from the ground below our wheels. Truly a remarkable experience. Coming off of Whitefish Pass John got a flat. We got it fixed enough to get to camp, but decided it was probably due to sharp rocks on over-inflated tires so we all dropped our tire pressure significantly. He was riding tube-less, which is something I know nothing about. Luckily he was able to get his spare on with a tube which got him to the bike shop in Whitefish where he could replace the tire and get his setup back to where he likes it. Finally at the top! Looking out towards Glacier National Park. We rolled into the Tuchuck campground and had the place to ourselves. We took quick baths in the ICY cold river and had a nice dinner. Leslie was the hero of the night who carried a bottle of wine all day which we chilled a tad in the brook and enjoyed with dinner. Leslie volunteered to uncork the bottle (with a screwdriver) and ended up with a fine mist of red wine all over herself! 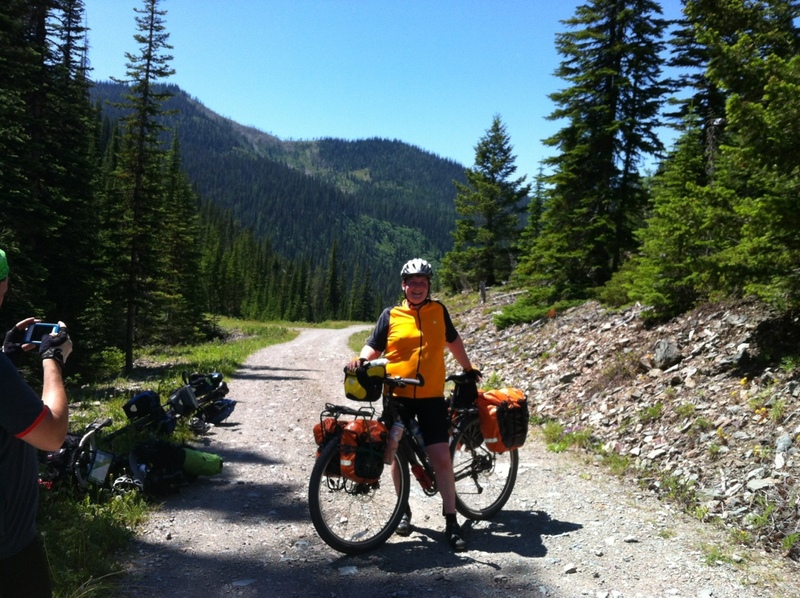 “Careening” down from Whitefish Pass – even 8 MPH felt fast over he uneven road! 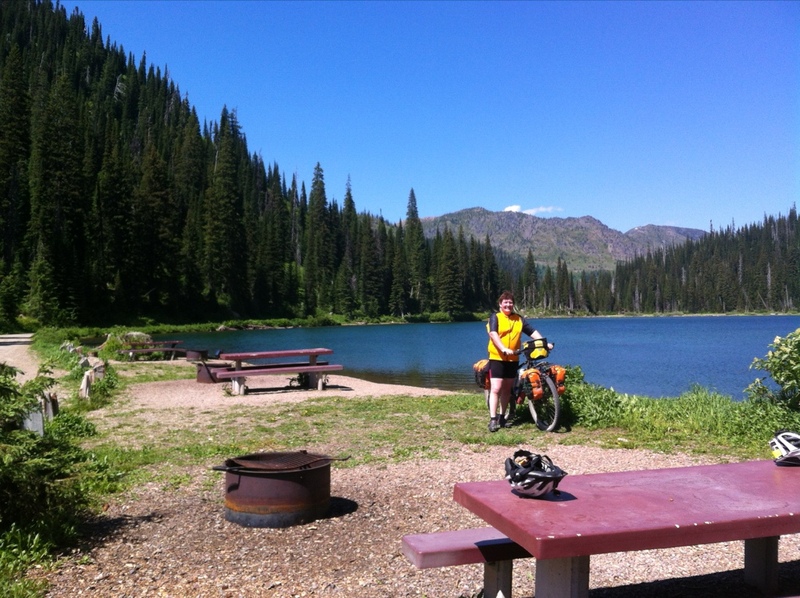 On our seventh day we rode an even thirty miles to the equally remote Red Meadow Lake. 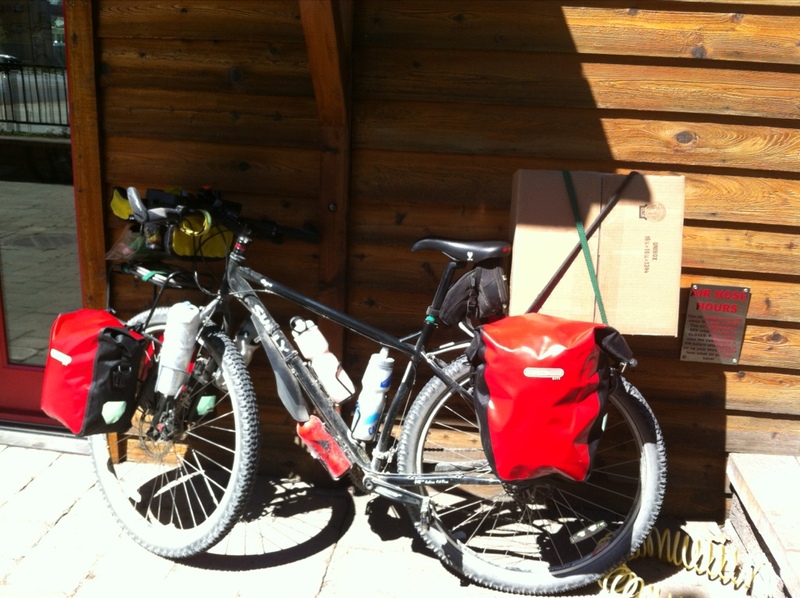 The first 18 miles or so was mostly descending off Whitefish Pass, though was still slow on the rough roads. We stopped for a quick break at the Wurtz Cabin, a cute little historic cabin now owned and rented out by the national parks service. I hadn’t felt like getting up in the morning, and we were all a little sluggish in the morning, not getting out of camp until 10! For some reason I was feeling particularly slow all day and really crawled up the last 12 miles of gravel road that lead steeply up to Red Meadow Lake. Two miles shy of the camp site we stopped for a snack. I’ve taken to eating a pepperoni stick and cheese stick simultaneously as my snack of choice, yum yum, instant energy! We dipped our helmets in the cold clear water for a quick cold shower and refilled our water bottles before the remainder of the climb. Once in camp we swam briefly to cool off and had a chance to chat with a local biologist who studies bear populations in this area. He pointed out the open grassy slopes of the mountain on the other side of the lake and said there was a good chance we’d see a grizzly over there – at a safe distance! Sadly, we did not. Brand New Panniers that will actually stay on my racks!! 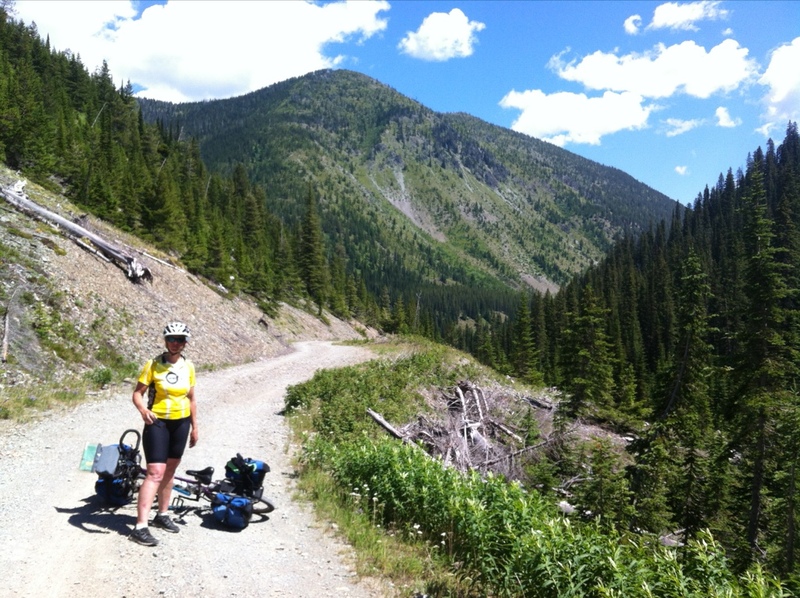 YAY Glacier Cycling in Whitefish Montana! This morning we awoke early to a what seemed like a big storm brewing so we packed up fast and left camp early. We tend to try to be on the road by 830 or 845 and today we’d gone almost 10 miles by 830. There is something to be said for getting up early. Most of the day today was descending from Red Meadow Lake to Whitefish Lake, but it was still slow and very, very bumpy. I had to stop every mile or so to reattach my panniers and was paranoid they would fall and break something on my bike or hurt someone riding behind me. The sense of relief of rolling into the bike shop this afternoon and mounting my brand new Ortleib panniers on my bike was fantastic. By my quick calculations we are about 8 days out from Helena which will likely be the next place I have cell service or internet access. I stupidly left my real camera at the hostel so can’t upload many pictures today, just these few I took on my phone. Off to get another several days supply of food and then back to the hostel to clean/lube my chain and make sure everything is set for returning to the wilderness. Great pictures! Thanks so much for keeping us posted. We really enjoy following along on your adventures.